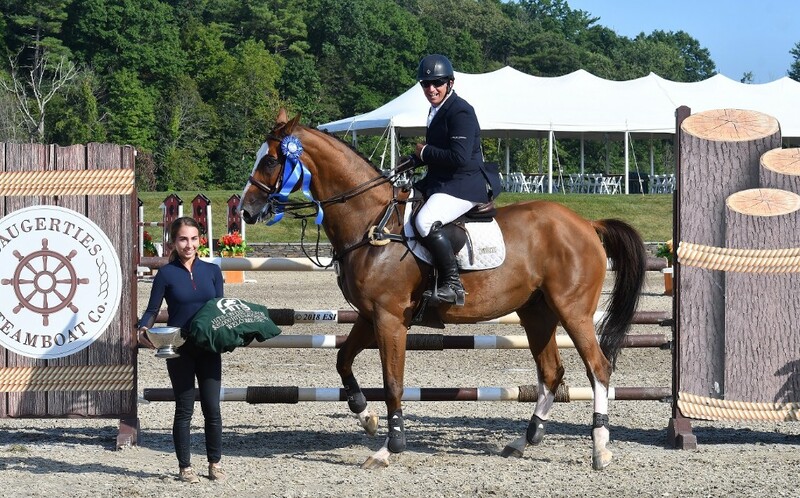 HITS » Aaron Vale Kicks off the FEI CSI5* at HITS-on-the-Hudson with a Win in the $35,000 Saugerties Welcome! Aaron Vale Kicks off the FEI CSI5* at HITS-on-the-Hudson with a Win in the $35,000 Saugerties Welcome! It was a beautiful Wednesday afternoon as the HITS Championship kicked off in the Grand Prix Stadium with the first of four FEI CSI5* classes offering $670,000 throughout the week. 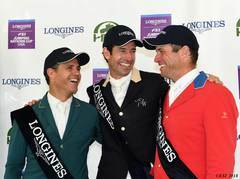 The field was stacked with top riders who will be going to the World Equestrian Games (WEG) next week: Mclain Ward and Adrienne Sternlicht of the United States, Emanuel Andrade of Venezuela, and Scott Keach of Australia. A third member of the United States Team, Devin Ryan, will be competing later this week. A total of 61 competitors took to the course for the $35,000 HITS Saugerties Welcome, with eight producing double clear rounds. First to return for the Jump-Off was three-time Olympic Medalist Mclain Ward. His ride on CONTAGIOUS was quick and aggressive in a time of 38.69, but a rail at the third fence kept him out of the top spots. Cormac Hanley would follow and produce the first double clear ride of the day, setting the Great American Time to Beat at 37.84 aboard VDL CARTELLO. The time would hold up for a third place finish when the class was over. Laura Chapot, already a winner of six Grand Prix at HITS Saugerties this season was next to go and showed her winning ways again. In the irons aboard CHANDON BLUE, Chapot pushed ahead of Hanley to finish double clear in a time of 37.30. Her lead would hold up for the next ten trips, but she would eventually take home the red ribbon for the day. David Raposa and ILIONA returned next with a clear round in a time of 38.41, to finish fifth. Along with ILIONA, Raposa also made it back to the Jump-Off with S & L SAGE but would finish just outside of the placings. Emanuel Andrade, eager to continue the success he had at HITS Chicago earlier this summer, had two horses in the jump-off, but it was not to be his day. An eight-fault score with RICORE COURCELLE and a four-fault ride aboard JOLI JUMPER kept him out of the top ten. 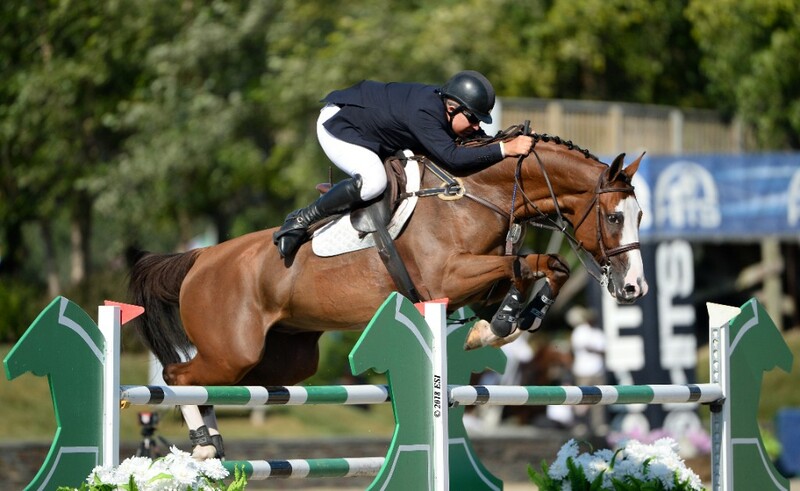 Olympic silver medalist Peter Leone and CAPITO Z, returned twelfth in the order and produced a smooth clear round in a time of 42.80 for eighth place. Leone has had his fair share of success at HITS Saugerties this season, including a win in the $10,000 Saugerties Steamboat Co. Jumper Classic during the Spring Series. Santiago Lambre qualified two horses for the jump-off, and his second ride aboard DINGEMAN was just fractions off a podium finish. A clean round in a time of 38.03 was good for fourth place. Just one trip later Aaron Vale entered the ring aboard MAJOR. Known for his speed and tight turns, Vale was in a great spot to know just what he had to do for the win. “As everyone here in Saugerties knows, Laura Chapot is a very fast rider and had the lead for most of the class, so I knew I would have to catch up to her," said Vale. Catch up with her he did, finishing in a blistering time of 37.09 to take the lead. "I had a couple of ideas, and I ended up taking a shorter track which was enough to take the win." With three riders to go, Vale was anxious to know if his time would hold up. Once more clear round, by Scott Keach, last to go in the Jump-Off, was the closest contender. With a time of 41.94, Keach would finish seventh aboard MARACA LS LA SILLA. While Vale hasn’t officially decided which of his horses will be his partner in the Saugerties $500,000 Grand Prix FEI CSI5* this Sunday, he thinks it may be FINOU 4 but said with certainty that "MAJOR could rise to the occasion and be competitive." We'll have to wait and see! Stay up to date with all of the results from the HITS Championship and HITS-on-the-Hudson VIII here. Tickets for the special events are available for purchase Online or at the Gate. Don’t forget that ShowHorse TV streams LIVE from the Grand Prix Stadium every day! Watch your favorite high performance horses and riders compete in the Saugerties FEI CSI5* this week! The high performance competition continues today with the $35,000 HITS Jumper Classic! Follow along with the Order of Go.